(Francisco Kjolseth | The Salt Lake Tribune) A Lime scooter in Salt Lake City on Tuesday, Oct. 2, 2018. A Senate transportation committee unanimously approved a bill Thursday that would square the hundreds of e-scooters dropped on Salt Lake City streets last summer with state code. Utah law currently prohibits scooter ridership on roads with posted speed limits higher than 25 mph or more than four lanes wide — descriptors that apply to many of the Salt Lake City streets where they’re commonly used. “This corrects that,” said the bill’s sponsor, Sen. Kirk Cullimore, R-Sandy. 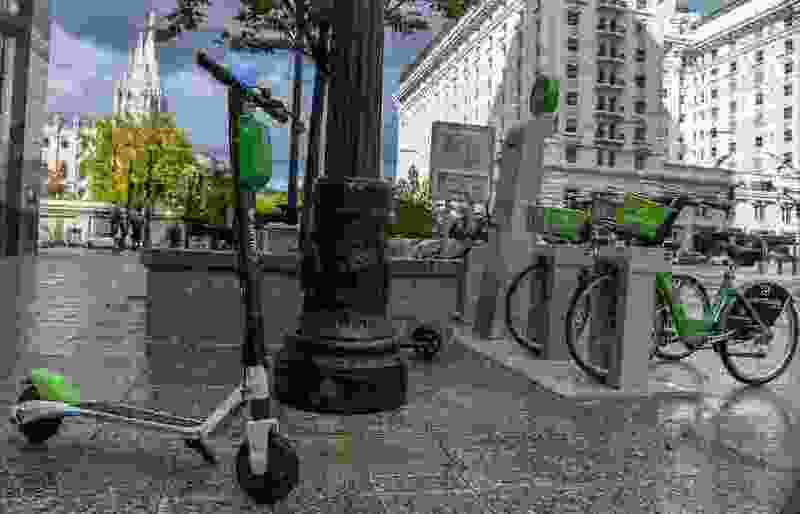 His proposal, which will now move to the full Senate, would regulate scooters similarly to bicycles and would bump the speed restriction to 35 mph. It also looks to establish restrictions on drinking or transporting an open alcoholic beverage while operating a scooter and on operating a scooter with more people on it than it’s been designed for. During the short committee discussion, lawmakers heard support from a legal representative for the scooter company Lime, a representative from Salt Lake City and Millcreek Mayor Jeff Silvestrini. “We think [the bill] addresses a lot of issues that are currently in place and helps us overcome them,” said Jennifer McGrath, Salt Lake City’s deputy director of community and neighborhoods. City officials had previously told legislators the biggest problem they’ve seen is users riding on sidewalks, which is prohibited and would remain so under this bill, SB139. Cullimore said he thinks his proposal would make it “more viable” for scooter users to stay on the roadway and out of the sidewalks. Salt Lake City officials have created a one-year operating agreement to govern Lime and its competitor Bird, as well as similar businesses, and are working to create a more formal ordinance. Though, passage of Cullimore’s bill could pave the way for the scooters to expand into other municipalities. Riders have frequently extended their trips beyond Salt Lake City, from West Valley City to Millcreek, and Lime has said it may look at expanding operations into the valley.